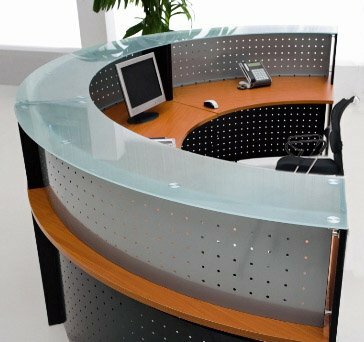 180 Degree Glass Top Reception Desk is comprised of three 60 degree sections combined for a 180 degree half circle desk. Components have a 60" radius which makes a 120" diameter. See inset drawing for additional dimensions. All work surfaces are 27-1/2" deep. Overall counter height is 43-1/2" high with 13-1/2" clearance underneath reception riser. See optional Mobile Locking Box/Box/File Drawer sold separately below. Ships unassembled for safety in transit. Shipping weight 402 lbs.